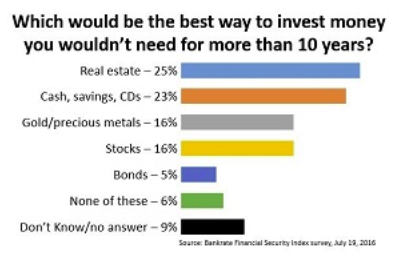 As identified in a recent survey*, Americans picked real estate as their overwhelming choice for investing. This is in spite of the Dow Jones industrial average reaching record highs recently. Stock came in as a third choice. Upon analysis of the recent survey*, it suggested that homes are more popular because they are a tangible asset. Whereas with stocks and bonds, your assets are not so tangible and you investments not so clear. Investing in homes has several distinct advantages over other investment alternatives. And you have reasonable control. A distinct advantage to investing in rental homes is that most people understand and are comfortable with them. Rental homes are the same type of property (in general) that you live in. It is easier to understand the key factors like home value, appreciation, rent payments, home maintenance and financing.